Parents of children with cerebral palsy are often highly motivated to do everything in their power to help their child living with cerebral palsy to reach his or her full potential. For those children whose cerebral palsy was caused by lack of oxygen during labour and delivery, parents may wonder if the delivery of a high concentration of oxygen to brain tissue may help heal the brain injury. Hyperbaric oxygen therapy is the inhalation of 100% oxygen inside a pressurized hyperbaric chamber. The air one typically breathes is 21% oxygen. The purpose of hyperbaric oxygen therapy is to increase the amount of free oxygen circulating in the blood which can travel quickly and deeply to injured tissues, promoting healing and recovery. The patient remains in the chamber, breathing pure, concentrated oxygen for 60 to 90 minutes. Typically, sessions (or “dives”) continue over several weeks or months. The use of hyperbaric chambers to allow the inhalation of concentrated oxygen has been approved by Health Canada, and it has been recognized as an effective treatment for a number of medical conditions including deep compression sickness (the bends), embolism, carbon monoxide poisoning, and others. 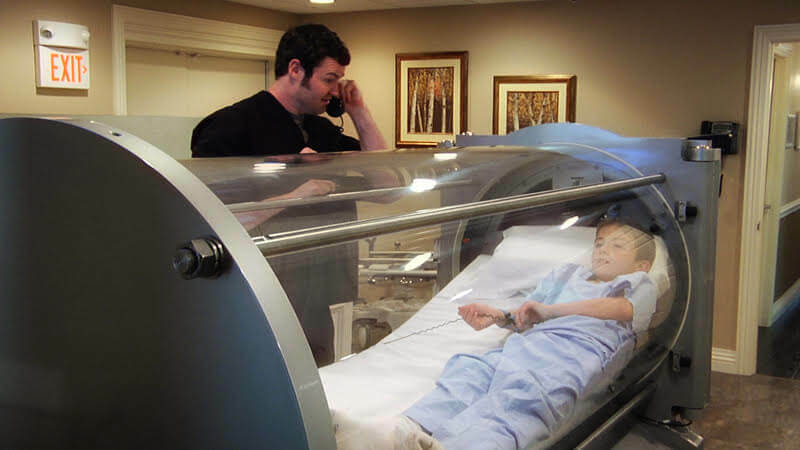 Can Hyperbaric Oxygen Therapy help my child? While there have been anecdotal accounts from parents of improvement in alertness and motor function in children with cerebral palsy following hyperbaric oxygen therapy, much of these favourable observations have been attributed to the placebo effect, or the expectation of improvement. Randomized clinical trials in which the observers did not know which children received 100% oxygen and which received room air in the chamber revealed that there were no beneficial effects from hyperbaric oxygen therapy. Can Hyperbaric Oxygen Therapy harm my child?